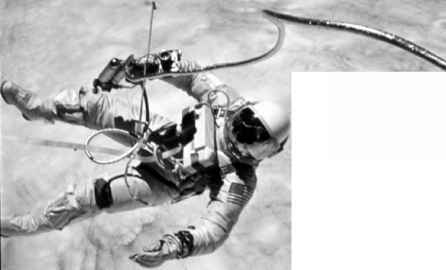 their spacecraft but also contained wires and hoses for electrical, communication, and life support systems. At the end of a spacewalk, astronauts pulled themselves along the tether back to their capsules. Nowadays, spacesuits have their own, completely independent systems included in an attached backpack, but cables are still used as safety lines that connect astronauts to their spacecraft or space station (Fig. 1.8). The tethers used for this function are relatively short, on the order of several meters. 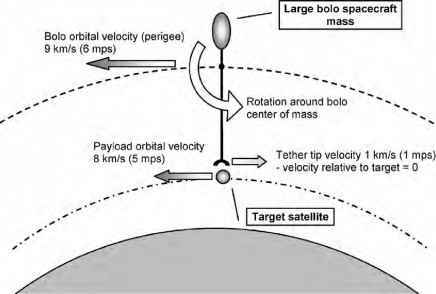 However, researchers at the Massachusetts Institute of Technology (MIT; Cambridge, MA) have devised an application with long tethers that can help astronauts strolling across the surface of small asteroids without floating away. Asteroids have very little gravity, so walking on them is much more difficult than walking on a planet. An asteroid with a diameter of less than 8 km (5 miles) would have so little mass and therefore gravity that an astronaut could easily fly off into space when making a small jump or even a step. Tying a lightweight rope all the way around an asteroid could be a solution; astronauts could attach themselves to this safety line and maneuver or even walk along the surface. The MIT researchers envision that their system will be deployed by an astronaut or spacecraft unwinding a spool of rope while flying around the asteroid. The rope might cut into the soft, granular surface of an asteroid, but even then it could at least give spacewalkers something to hold onto.